With clearing technology developed and the means to train auditors to use it, HGCs were cracking cases one for one. The era of invariable and uniform results had arrived. As L. Ron Hubbard told the 22nd American ACC, “We have merely charted a route not only through life so a fellow can pilot it, we have also charted a route through the data we have found out about life so that you can bring somebody off rather rapidly.” From that perspective, he had now decided to open the gates to new people. And with an exact course to greet them, fully presented at the Anatomy of the Human Mind Congress, came an exact session to audit them. Specifically, a Model Session, with Mr. Hubbard teaching the first‑ever script. Here is data of such paramount importance he told auditors not to learn it cold, but “hot, hot, hot!” And with the goal to create superlative professionals, he provided detailed instruction on everything, from present time problems and why they deny preclears reality on the back track, to the full mechanics of the reactive bank. While as for the importance of these lectures, Mr. Hubbard would order their study by every one of those case‑cracking HGCs. It was January 1961 and Mr. Hubbard’s Advanced Clinical Course program of Research and Development was accelerating to both a conclusion and a pinnacle of achievement not previously envisioned. For having developed the technology to bring every being to Clear, he’d also developed the procedures to train every auditor to apply that technology. Whereupon, and almost without taking a breath, he turned his attention to the last and crucial step. Because, and what was manifest, the only thing left that could prevent every being from achieving freedom was simply and only if they yet didn’t avail themselves of it. Hence, the technology of Presessioning to bring every being to enlightenment and put them in session (London Congress on Dissemination & Help). And with these techniques put to practice in auditing application (1st Saint Hill ACC), it truly was a new plateau—cases cracked one-for-one and the dawn of the era of invariable and uniform results. So it was that L. Ron Hubbard could now “throw the switch” on dissemination and open the gates to new people flooding into Scientology. With a precise and exact course to do it (Anatomy of the Human Mind Congress) he was about to provide the precise and exact session for when they arrived. Indeed, not just something applicable to a particular process but, rather, the procedure for every session. “A Model Session must be perfect. If anybody gets out of this Unit without being able to do a perfect session from beginning to end, I’m going to ask them to turn in their thetan. You hear me now. Quite important. Dianetic Assists—their use in Presessioning. 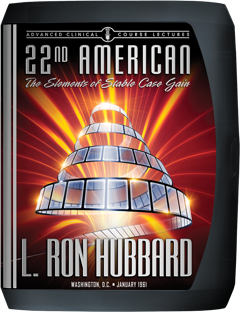 In testament to what was achieved, when the skills of those auditors were applied to a series of slow moving cases, the difference in terms of accelerated gain is best characterized by L. Ron Hubbard’s own comment that all were now “moving like startled gazelles.” While befitting the importance of these lectures, Mr. Hubbard would order them as mandatory study for every one of those case-cracking HGCs.